Best Ice Fishing Shelter & Equipment – What Gear Are You Missing? Have you ever had the urge to leave your warm, cozy home in the dead of winter to hang out on a frozen lake for hours at a time? If your answer is yes, you might want to give ice fishing a go. Though it may not sound appealing on the surface, it is a beloved sport that tons of anglers consistently brave the cold for. Because it takes place in extreme conditions, having the best equipment is important, not only for reeling in catches but also for your safety. There are many things to consider when compiling gear for an ice fishing trip, including rods, shelter, and much more. In this article, we're going discuss some of the essential equipment you must consider before getting out on the ice. Sorting through your fishing gear before an ice fishing trip can be a daunting task. Here are a few essentials that should always be included. Auger: An auger is a device used to drill a hole in the ice. No matter whether it is gas-powered or manually operated, a great auger should have super sharp blades that can cut through layers of ice easily. Rod: A good ice fishing rod should be very sensitive, yet strong. They should be able to detect timid bites from small catches while still being able to pull in large, heavy, trophy fish. Reel: Ice fishing reels should be easy to use and tangle-resistant when it comes to the fishing line. Aluminum is the most desirable material for an ice fishing reel to be made from because it is strong and durable. Ice Fishing Flasher: An ice fishing flasher is an added bonus to many angler’s gear. It allows an inside look at what’s happening below the surface of the ice. This makes it much easier to know where fish are located and therefore, where to place a line. Having great shelter-related equipment is vital for ice fishing. This means there are several must-have features your fishing shelter should have. Ice fishing heaters: These devices should be an essential part of your gear because they are perfect for heating small ice fishing shelters. There’s nothing worse than being cold for extended periods of time, and portable heaters are a great way to combat that. Pop up shelters: Because you risk exposure to dangerously low temperatures while ice fishing, having some sort of shelter to shield you from the elements is important. Pop up shelters are a great option because they tend to be very portable and easy to set up. Bibs: Outerwear is another aspect to think about. A bib/overall set is a good option for an ice fisher as it covers a large amount of the body with one clothing item. Search for a bib that is insulated to keep you as warm as possible. Because there are so many pieces of gear that go into a day of ice fishing, we’ve put together a list of some of the essentials. These are our favorite choices of great items to have on hand on the ice. This bolt also allows the handle to come off the auger, making the frame easier to transport and store. The dual-flat blades are created with stainless steel, which is super sharp and durable. It comes with a blade protector to prevent dings and dents when the tool is not in use. The Eskimo Hand Augers are simple but effective. They win points for their high-quality cutting blades, which make drilling a breeze, and also for their portability. 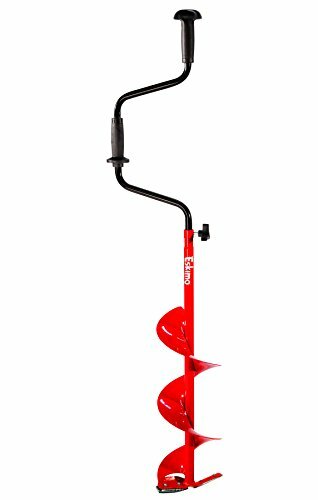 If you’re planning on hiking or trekking to a mountain lake, this auger is a great option because it is lightweight and not super bulky. Because it can have a harder time with very thick ice, this is a good auger to use in earlier or later ice fishing season. 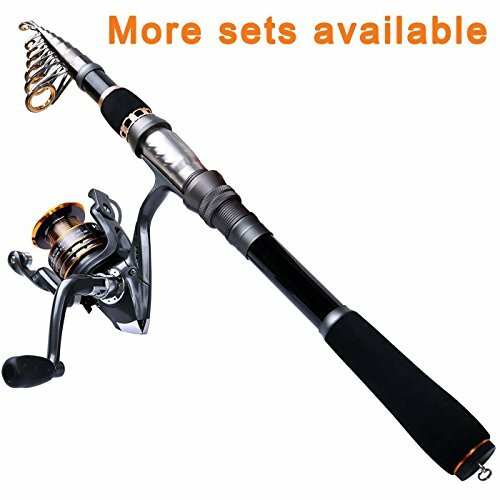 This ice fishing rod is a combination rod that comes in a couple different sizes, ranging from light to medium-heavy action. It features an Ugly Stik GX2 spinning rod with a comfortable foam handle and twist-lock reel seat. The rod is created with a composite blend of graphite and fiberglass. The fiberglass adds to the durability of the rod, while the graphite ensures sensitivity to bites and smaller catches. The spinning reel is a size 20 and comes with one ball bearing. It also features a ported aluminum spool, intended for added durability at a lighter weight. The Shakespeare Ugly Stik is a great basic combination rod. It’s strong and flexible enough to pull in big fish, while not losing the sensitivity of more lightweight rod. Ugly Stiks are known for their quality, and this rod is no exception. The only area that this rod loses points is in the reel. Although it works just fine, users say the material feels less durable than the rod and it doesn’t come with line. This fishing combination kit comes with everything you’ll need for your first ice fishing trip. It features a range of items from a reel and rod to a set of fishing lures and line. The telescoping rod comes in several different lengths and actions. It’s created with graphite for sensitivity and has an EVA foam handle. The guides are made with aluminum oxide. The reel has an S-curve oscillation, which makes line winding easier. The set features a plastic tackle box with several lures to choose from and a roll of line. All of these items come in a compact carrying case. This kit is a great all-in-one option for first-time ice fishers. This is an especially good pick for ice fishing because of the portability of the rod and reel. It’s lightweight and retractable, so it condenses down to a small size before and after use. If you’re planning on trekking into mountain lakes, this is a great option for you. Though it does come with a carrying case, it’s not great quality, so consider ditching the one it comes with and bringing your own. 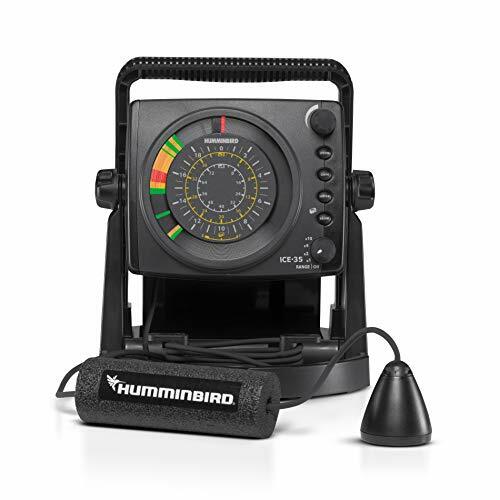 With several qualities that assist anglers in locating fish, the Humminbird ice fishing flasher is well-known and loved. With the help of a dual-beam sonar, users can choose from a wide range, which provides a bigger picture of the underwater surroundings, or a narrow range, which has the ability to show great detail of a smaller area. The device features a depth capability of up to 200 feet. The user can also adjust the depth ranges from 1x-10x. Zooming capabilities allow for a magnification of specific depth ranges, which you can alter depending on where the fish are located that day. The bed of the body of water, fish, and your lure are depicted on the tri-color fiber optic display. It also indicates depth scales. The Humminbird ice fishing flasher does its job well. It covers all the necessary bases with its dual sonar technology, and several additional features add to the quality of the device. This is also a great tool to travel with as it’s not overly large or bulky, which makes it easy to transport from different locations. In addition, its battery life is tough to beat. The transducer system does come with a lot of cords to deal with, so ensure that this won’t be a major annoyance for you before purchasing. 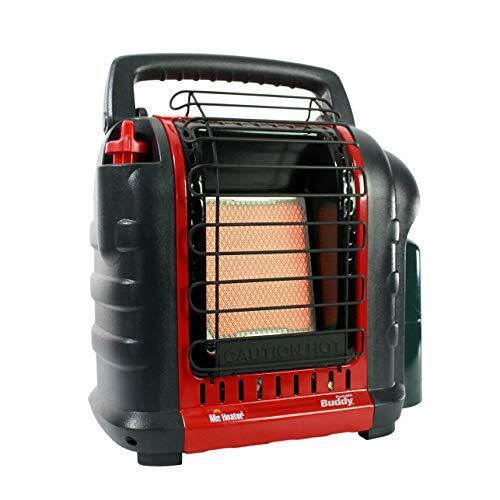 A trusted brand for many ice fishers, Mr. Heater’s portable buddy has earned this spot for several reasons. The device’s BTU ranges from 4,000-9,000 and has the ability to heat spaces up to 225 feet. It’s clean burning and nearly 100 percent fuel-efficient. The frame is fairly small and portable and features a fold-down handle for additional space in a small shelter. It also features extensive safety features, including shut-off mechanisms when the machine tips over or when it detects low oxygen in an enclosed space, and a high-temperature wire guard. The portable buddy heater is well-loved for a reason. It’s got a great range of safety features to give you a little peace of mind when you’re in an enclosed space on the lake. It’s also able to heat a variety of spaces, so no matter if your shelter is tiny or on the larger size, this guy will do the trick. Because it has some issues operating correctly on windy days/at high altitudes, keep in mind your fishing spots before purchasing. This pop-up shelter has the capacity to hold two people. Eskimo claims that the pop-up design only takes 60 seconds to set up and is quick to take down as well. The skin is made with a high thread count and tighter weave, which makes it more likely to combat wind and ice. The structure is made with fiberglass poles for durability, a metal ball, and sockets. It’s anchored to the ground with self-tapping ice anchors, so you don’t have to freeze your hands in the process of setting up the shelter. The shelter folds down into an oversized duffle bag which can be carried as a backpack or as a bag. 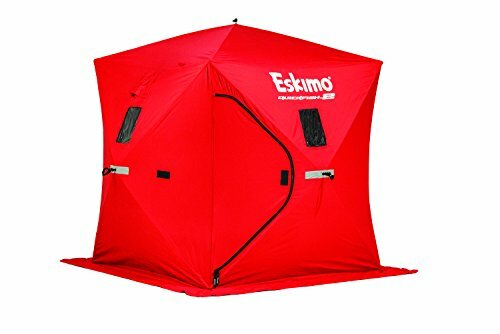 The Eskimo pop-up shelter is a great option for any angler hoping to stay warm on a frigid day on the ice. There’s nothing like having a structure that is super easy to set up and take down when you’re exposed to the elements. An added bonus is that the whole structure can fit in a duffle bag. Because this isn’t the tallest structure, if you’re very tall, a different option might work better for you. 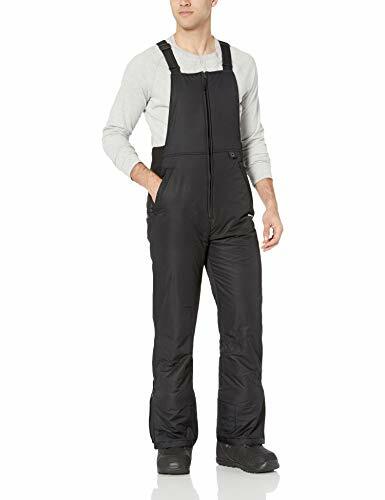 These snow overalls are made with 100 percent polyester and are made to keep moisture out on cold days. They come in several different styles and sizes. Each pair features “ThermaTech insulation”, a lightweight material advertised to keep you warm in temperatures ranging from 35 to - 25-degree temperatures. They’re made to fit over bulky boots and feature boot zippers as well as boot gaiters with grippers to prevent moisture from leaking into your shoes. The overall straps are adjustable and the body features elastic in the sides to allow for a good range of motion. Because you’ll be sitting for long periods of time in the cold, having good outerwear is important. Although they may not be the most stylish choice, these Arctix overalls should do the trick. Their most admirable quality is their insulation, which will keep your body warm despite sub-freezing temperatures. Many users say that these overalls tend to run a little small, so consider purchasing a larger size or take an in-depth look at the sizing chart before making your decision. Each piece of equipment outlined in this article will obviously differ in terms of setup and use. Keep your feet shoulder width apart; the handle should be near your chest so you should have to hunch or bend. Apply constant pressure with one hand at the top of the device while the other hand cranks the screw. Your ice fishing rod and reel should be the same set up as your normal rod; read the instruction manual for guidance if needed. The video below covers some of the items we’ve talked about in this article, as well as some other tools you might consider purchasing before an ice fishing excursion. Cleaning and caring for your fishing rod and reel is pretty self-explanatory. After a day on the ice, wipe them down with a clean rag to remove grit and grime. Leave in a room-temperature setting to dry. An ice fishing flasher should be properly stored in a case or equipment bag where it won’t risk being damaged. Don’t store the flasher in a garage or back of a vehicle where it would be exposed to continually sub-freezing temperatures. After use, gently wipe down the auger with a hand towel or rag to remove any dirt residue. Inspect blades to see if any cracking or dulling has occurred. If so, they may need to be sharpened before the next use. Reattach blade cover to prevent any possible dings or dents. Take the tool apart and tip upside down to dry. The video below demonstrates the aforementioned steps in cleaning and caring for a hand auger. Now that you know some of the essential gear for ice fishing, as well as some of our favorite picks for said gear, you’re ready for the ice. Though ice fishing may seem like it’s not for the faint of heart, with freezing temperatures and extreme weather, having the right tools can make the experience doable for anyone.